Ryan Gosling ditched the 2015 Oscars to go to Disneyland with Guillermo Del Toro. 2. In 2001, Kim Jong Il's eldest son (Kim Jong Nam) was caught using a fake Dominican passport to enter Japan. When asked for an explanation, he said he "just wanted to visit Disneyland." He was subsequently disowned by his father. 3. When Disneyland opened, visitors had the option of arriving by highway or skyway (helicopter). However in 1968, 12 years after Disneyland opened, the skyway ended after a crash took the lives of 23 people (20 passengers and 3 crew members), the worst civilian helicopter crash in U.S. history. 4. Doritos was invented at Disneyland to help curb costs of leftover tortillas. 5. Emperor Hirohito of Japan was a huge fan of Mickey Mouse. 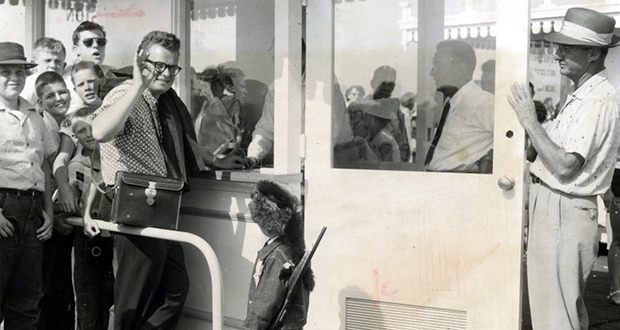 He was given a Mickey Mouse watch as a gift during his special tour of Disneyland in 1975. For years, even on formal occasions, his Majesty was observed wearing the watch. It's forbidden to fly over Disneyland or you will be intercepted by fighter jets, just like over the White House Airspace. 7. The opening day of Disneyland was referred to by Walt as "Black Sunday" as rides broke down, the freshly paved asphalt had women's shoes sticking to it, a plumber's strike made Walt choose between bathrooms and drinking water, restaurants ran out of food, among many other problems. 8. Until the late 1960s, men with long hair were prohibited from entering Disneyland because it did not meet the standards of Disney's unwritten dress code. Employees were also prohibited from having any facial hair because visitors would associate it with un-American activities. 9. Employees of Disney World and Disneyland were prohibited from having mustaches, beards, and goatees for nearly 50 years until the ban was lifted in 2012. Soul patches are still banned. 10. Disneyland had to close the "It's a Small World" ride for several months in 2007 for renovations because people were too fat for the ride and the boats were regularly getting stuck. The first guest to enter Disneyland was a college student named Dave MacPherson. He didn't ride a single attraction because he had to get back to school. He was awarded a lifelong ticket to Disneyland (with up to 3 guests). The ticket has since extended to include Disney parks around the world. 12. Stanford University's band has been banned from several campuses and even Disneyland. Some of their offenses include mocking a case of a missing girl at Southern Cal during halftime and playing outside OJ Simpson's trial. 13. At night, Disneyland becomes overrun by stray cats. Disney embraces them because they keep the mouse population in check and treats them like pets, including spaying and neutering them and giving them shots. 14. There are Disney "gangs" that frequent Disneyland in California. 15. The Pirates of the Caribbean ride at Disneyland once used real skeletons taken from UCLA's Medical Center. Rumors still persist that a few of them still remains in the attraction. Disneyland used to employ young women as mermaids who would swim in the water around the Submarine Voyage ride. 17. A Disneyland employee working as Winnie the Pooh went to court for slapping a child. After recess, the man returned in costume, jigged, and answered questions on the stand in full character. The jury acquitted him after seeing the costume's short arms disallowed slapping someone at child height. 18. A woman sued Disneyland for $150,000, claiming one of the Three Little Pigs fondled her and caused her to gain 50lb. Charges were dropped when the defense presented the costume complete with inoperable arm stubs. 19. Walt Disney refused to allow Alfred Hitchcock to film at Disneyland in the early 1960s because he had made “that disgusting movie Psycho (1960)”. 20. The organ seen in the ballroom on the original Haunted Mansion ride at Disneyland is actual organ played by Captain Nemo in 20,000 Leagues Under the Sea. When President Harry S Truman visited Disneyland in 1957, he refused to come aboard the popular Dumbo attraction. Truman, a Democrat, didn't want to be seen riding in the symbol of the Republican Party. 22. 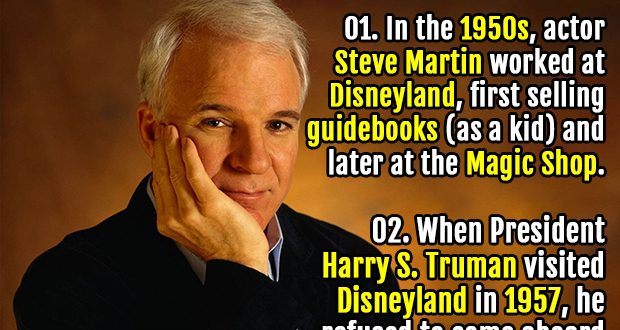 In the 1950s, actor Steve Martin worked at Disneyland, first selling guidebooks (as a kid) and later at the Magic Shop. 23. 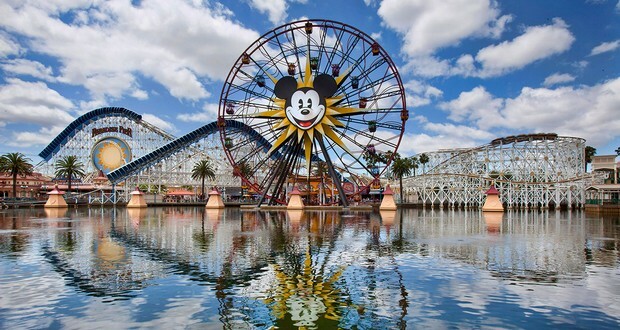 Walt Disney was inspired to build Disneyland after taking his daughters to ride the merry-go-round at L.A.'s Griffith Park. 24. Disneyland uses more than 100,000 light bulbs to outline the buildings on Main Street, U.S.A.
25. Two of the key figures in creating Disneyland were Harrison Price and CV Wood. Their nicknames were Buzz and Woody. The picture of Harry S. Truman (#21) is actually a picture of President Dwight D. Eisenhower. Thank you for pointing it out. We have changed the picture. I thought that was Eisenhower!! !